​Durability - We make our products more durable so they last longer and stay stronger. Greater durability means you don’t have to waste time with constant reorders or repairs. You get more value through ongoing cost savings. Dependability - Sure, our products are dependable, but we take it further than that. We also make sure our people and our processes are dependable, ensuring a worry-free experience for our customers. Proven Values - Our guiding principle may sound idealistic to some, but we live it every day. We make plastic products, but we do business with people, all of whom deserve our respect and consideration. ​Made-to-Order Quality - All of our products are made to your exact specifications, ensuring a perfect fit for your needs. And, if you need something we don’t already have, we’ll work with you to make exactly what you need. If you can think it, we’ll find a way to make it. Remcon.com was created in 2015. Shortly thereafter, my focus turned to creating online calculators that allowed customers to see their savings compared to competitive products. When considering the different options for material handling needs, true cost is determined by how long the products last, rather than their initial purchase price. 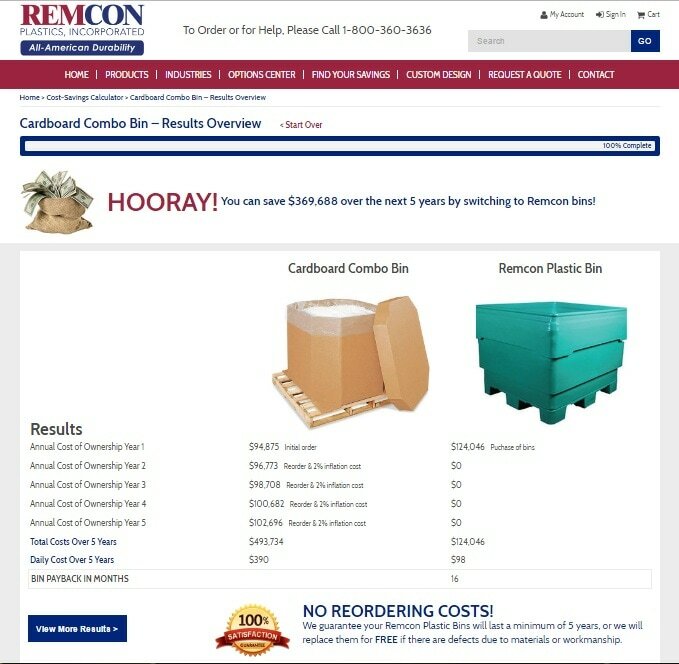 Low-quality containers that crack or lose their shape generate more waste and require more reordering than durable, bulk containers from Remcon. Remcon guarantees its bins will last a minimum of 5 years, or they will be replaced for FREE if there are defects due to materials or workmanship. This guarantee, coupled with the durability of the products compared to the competition, allowed me to create a very compelling value proposition that was quantifiable and customizable for each customer. In late 2006, after 5 years on the ATG Dynamo e-commerce platform, we decided there were other platforms that better suited our needs. I led a team of marketing and technical people and together we researched e-commerce packages. In 2007 we decided to move to IBM WebSphere Commerce due to support and functionality reasons. Over 80% of our energies and focus then went into creating capabilities, developing processes, and adding content so that the web experience more similarly paralleled what a customer could get and do if they were on the phone with one of our folks in customer service. 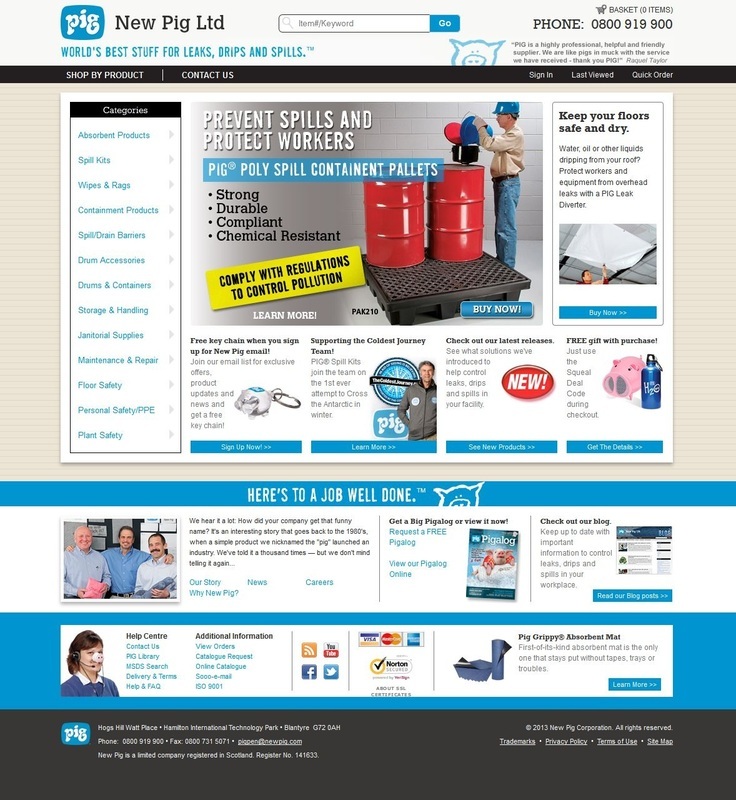 By the end of 2008, after working with IBM, technical consultants, and IT and marketing teams, we launched 5 new sites: US Industrial, US Federal, Canada, UK, and an International end user site. Very little of our energies went into the look, feel, and visual experience of the new sites. In 2009, we shifted to make the look, feel, and visual experience the primary focus. At the same time, New Pig was re-examining its brand and branding standards, an effort in which I was deeply involved. I led the effort over the next few years to evolve the look and feel of the site to align with the new brand requirements. 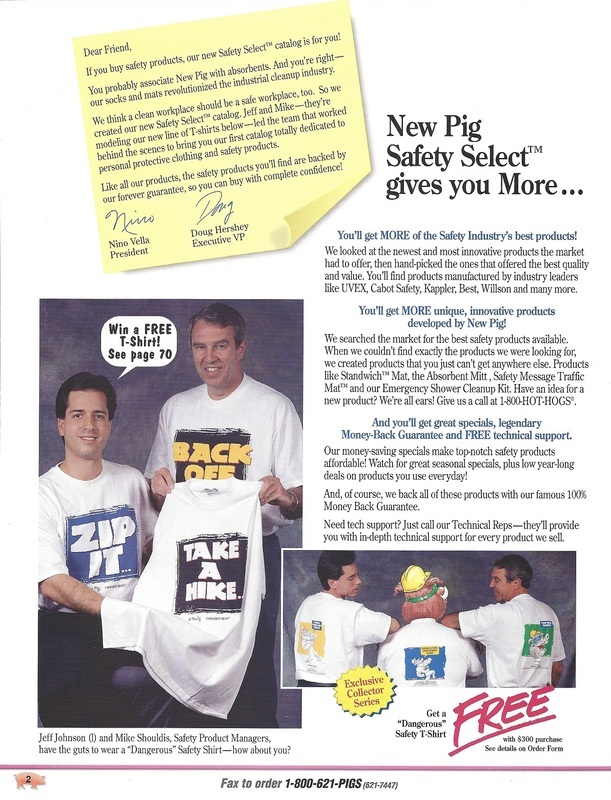 New Pig began adding merchandised products to its catalog in 1990. Industrial safety products were a natural fit. 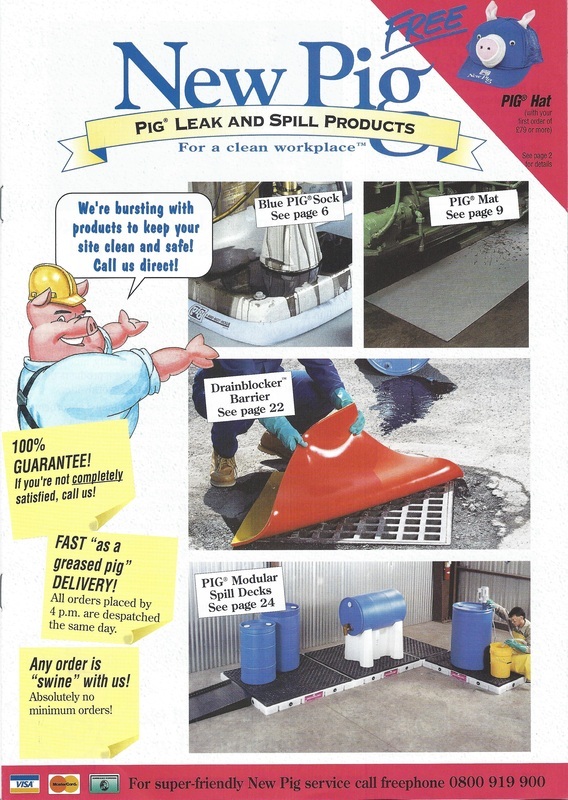 The core manufactured absorbent products were used in dirty, slippery, and potentially hazardous situations. 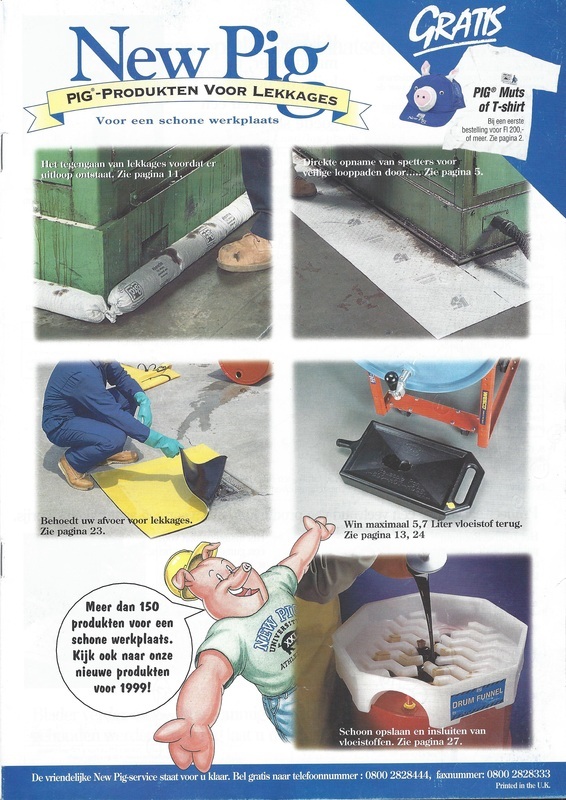 Safety products helped the customer protect their employees while using absorbents to clean up leaks and spills. 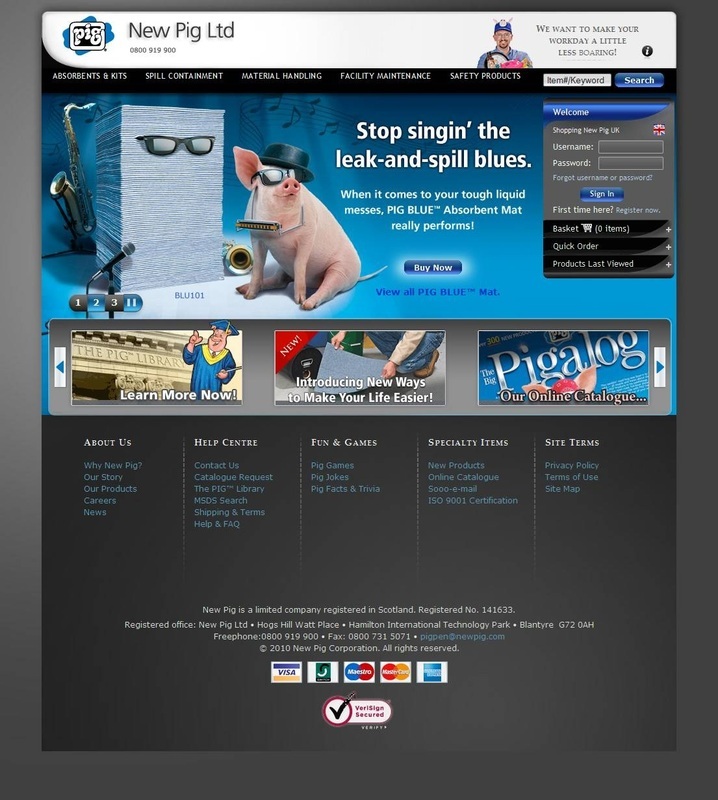 Additionally, these products provided the customer with a one-stop-shop experience. 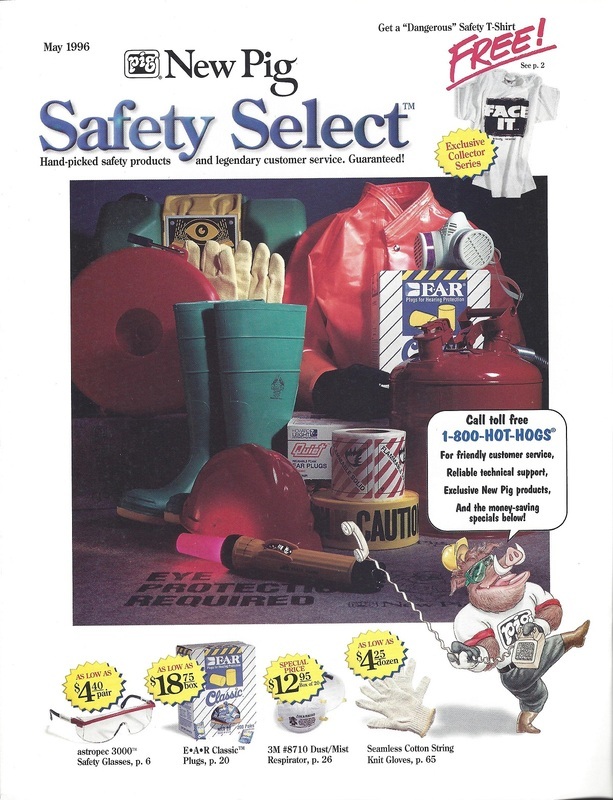 There were 4 pages of safety products in the 1990 main catalog. Over the next several years full lines of eye protection, eyewashes/showers, ear protection, respiratory protection, protective clothing, decontamination equipment, gloves, foot protection, instrumentation, lockouts, safety lighting, signs/labels, confined space/fall protection, first aid, ergonomics, and floor safety were built. 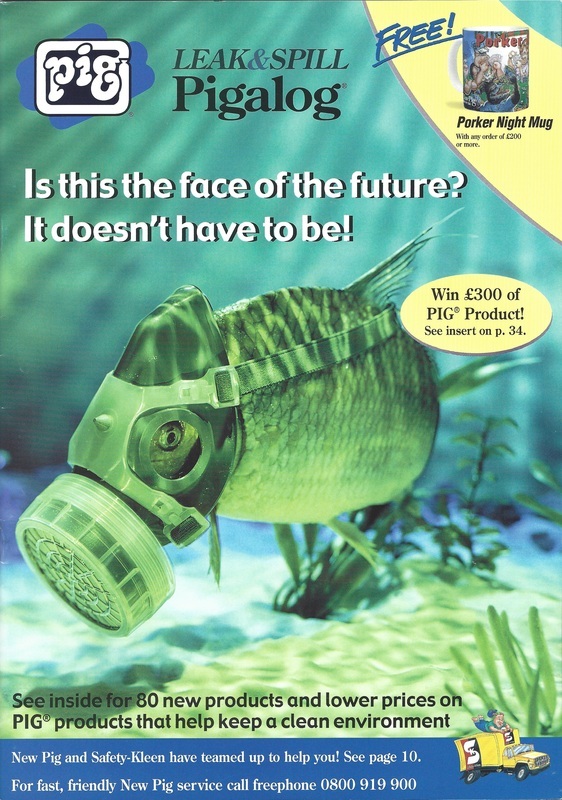 By 1996 there were 116 pages of safety products. 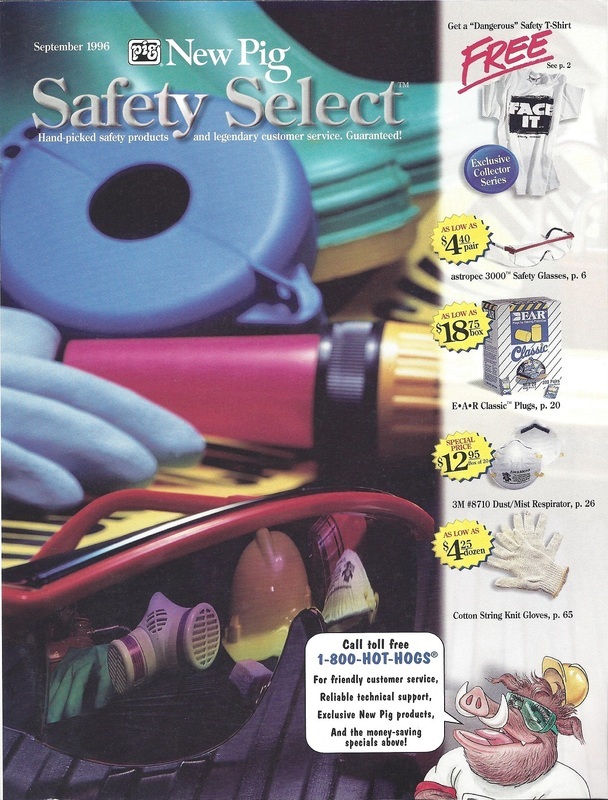 I grew the sales of the merchandised and private labeled safety products line from $300K/year in 1990 to $2.8MM/year in 1996. This success came from using direct marketing, market research, competitive analysis, vendor negotiation, product positioning, and profitability analysis to add over 1000 items. 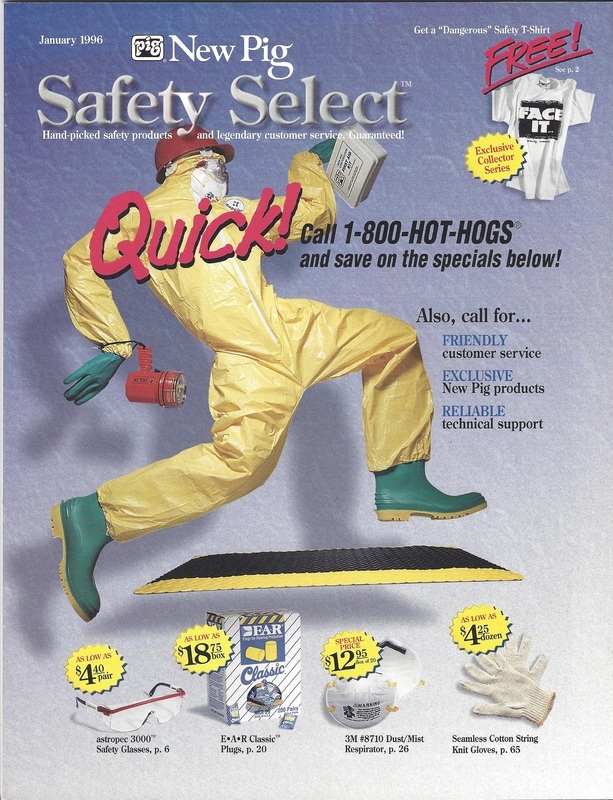 By 1996, there were enough products to offer a specialty catalog, named Safety Select, to customers. Safety products continue to be an integral part of the offering. 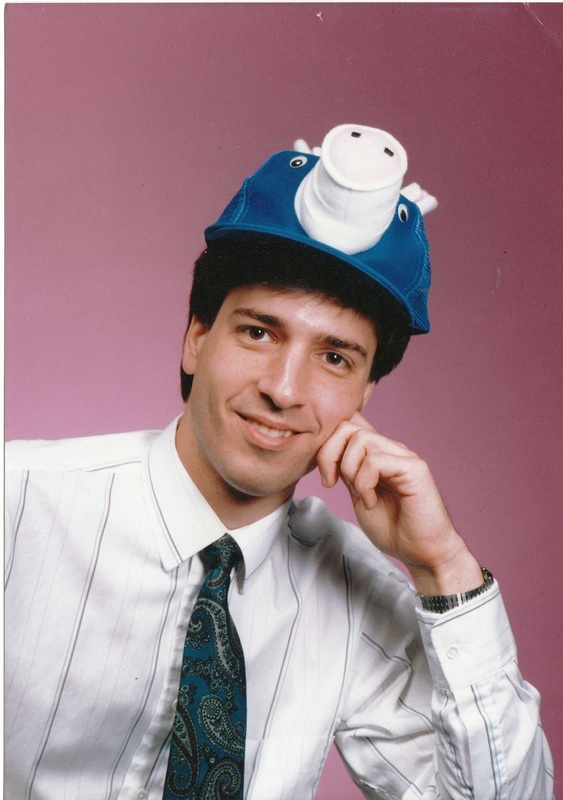 My favorite picture wearing the classic New Pig snout hat! 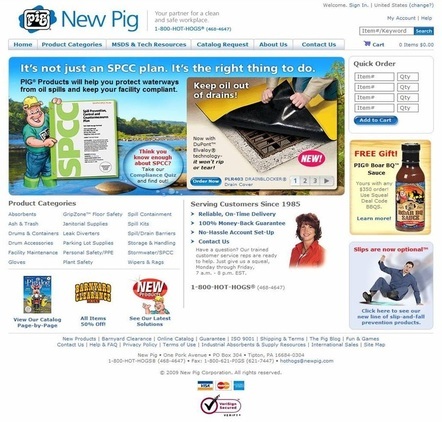 New Pig began building its base of European distributors in the late 1980's. Initially, all support and fulfillment was provided through Tipton, PA. Soon after, a subsidiary in the UK was created and it successfully serviced distributors in the British Isles. However, the time difference between Tipton and Continental Europe, along with no sales support in Continental Europe, and the cost and time constraints of only being able to ship containers from the United States all created pressure to change. Beginning in 1996, I hired a Continental European Sales Manager, contracted with a public warehouse in Belgium, and led a team to create a fully-owned subsidiary in the Netherlands for distributor sales, support, and fulfillment. This commitment cemented our offer in Europe and delighted our distributors. Around the same time, New Pig decided that it was time to extend its successful US direct marketing efforts to Europe in order to grow market share. I led a team to augment the distribution-oriented businesses of the UK and Netherlands subsidiaries. 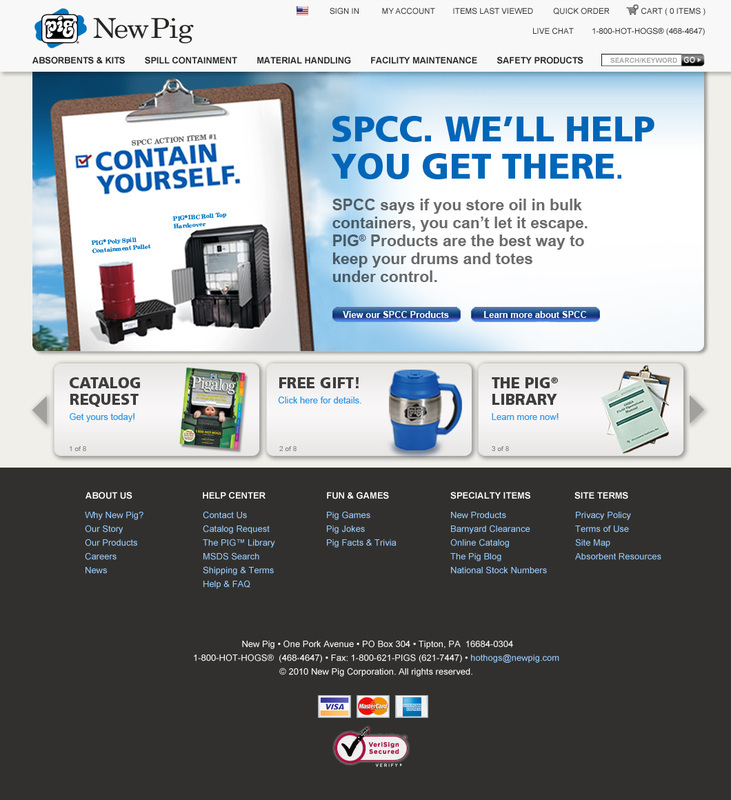 We installed systems, built competencies, created catalogs, and selected end user lists. We taught our colleagues how to market directly to end users, measure the results, and refine the process. As a result of these efforts, both companies continue to be successful direct marketers to this day. Both business now support end users and distributors, have a greater understanding of their respective markets, and have grown in sales and market share. I was tasked with creating a clear, concise, and compelling case for each Phi Sigma Pi Foundation Fund. Through communicating the clear and unique purpose of each fund the goal was to inspire potential donors to donate to causes that mattered most to them. In addition to using the positioning I created for the 9 funds (see below) on the Foundation website, I also created several targeted brochures explaining the funds as part of larger solicitation campaigns (see below). These brochures were also used in conjunction with speeches promoting the funds and handed directly to potential donors. Positioning: The fund for those who want to invest in supporting the graduate education of an alumni Brother. Additionally, this fund is ideal for those believe strongly in the pursuit of the highest educational opportunities. opportunities through the graduate education of an alumni Brother. Positioning: The fund for those who want to help a Phi Sigma Pi Brother who is facing a financial hardship due to natural disaster, medical expenses or other extenuating difficulties. It is a way to unite and show support when “one of our own” is facing a difficult situation. Headline Essence: Lend a helping hand to a Brother facing an extraordinary financial hardship. 100th anniversary of the founding of Phi Sigma Pi. Supporting this fund commemorates the ongoing mission of Phi Sigma Pi. Headline Essence: Celebrate the centennial milestone of Phi Sigma Pi’s ongoing mission to enrich the individual, campus and community. Positioning: The fund for those who want to invest in supporting the college education of a current undergraduate Brother. Additionally, this fund is ideal for those wishing to pay tribute to the rich legacy, achievements, and contributions of Dr. Todd and Sweetheart. ​Headline Essence: Support the education of a collegiate Brother while paying tribute to the contributions of the Todd’s. Positioning: The fund for those who want to invest in the ongoing ability of the National Headquarters facility to meet the needs required to support the vibrant health of our Brotherhood. Additionally, this fund is ideal for those wishing to pay tribute to the rich legacy, achievements, and contributions of Joseph Torchia. Headline Essence: Invest in the ability of the National Headquarters facility to support the vibrant health of our Brotherhood. Positioning: This is the ideal fund for those who want to ensure we build stronger leaders within our Fraternity. 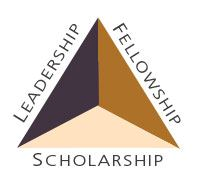 This fund primarily supports additional training, education and dialog at national events as a way to increase the strength of our chapters and to develop future national leadership candidates. Headline Essense: Build strong leaders and promote “the full Phi Sigma Pi experience” by helping Brothers participate in National educational and programming initiatives. Headline Essence: Champion a financial safety net to protect, enhance and strengthen our Brotherhood for years to come. Positioning: The fund for those who want to support Phi Sigma Pi’s efforts in advancing the mission of our national philanthropy, Teach For America. This is the ideal fund for those who want to support Phi Sigma Pi in its effort to provide greater educational opportunities for students in our nation's most disadvantaged communities. Headline Essence: Sponsor Phi Sigma Pi’s national philanthropy and enhance the education of our nation's children. the Foundation as it endeavors to benefit both the immediate and long-term health of the entire Fraternity. Headline Essence: Provide the most impact by giving the gift of flexibility.